Lady bugs are part of a rich organic gardening and farming heritage. A second grader can do a report about why they are important to our biodiversity and overall food supply. They get rid of numerous agricultural pests, including aphides and mites without posing other risk to human health. But while their bright red and black spots signify that they are toxic to predators, it turns out that Monsanto’s herbicide RoundUp and glyphosate-resistant crops are toxic to them. Cry1Ab toxins (B. thuringiensis) found in GMO crops are killing our lady bugs. In this very same study it was found that Bt toxins increase lady bug mortality by killing their larvae. The toxin that was cross-bred with GM crops to be resistant to pests is also killing one of nature’s biggest pest controllers. 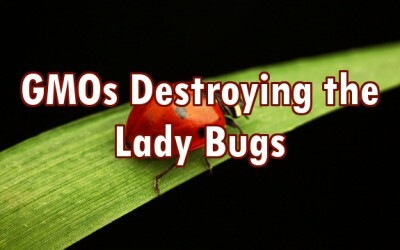 If you want to save the lady bugs, don’t spray pesticides or herbicides on your plants. If you buy lady bugs commercially to disperse in your garden, you also need to provide them ample food by having lady-bug friendly plants (dill, fennel, dandelion, coriander, Hairy vetch, yarrow, butterfly weed) that they can dine on when they are done overwintering. You can also mix brewer’s yeast with a little sugar, honey, and warm water to offer them a respite before they start munching on the insects that would munch on the crops you’ve planted. Cry toxins are also associated with human red blood cell damage and leukemia. Looks like lady bugs and people alike need to look out for Mansanto’s Bt poison.